I haven't had one of these posts in the loongeestt time, but worry not my lovelies, I still love me some snake inspired jewelry! I'm off to the beach this weekend and I won't be back until Monday, so I hope you guys have a fun weekend! This piece is gorgeous and if Kenneth makes this in turquoise...then I think it has your name on it! 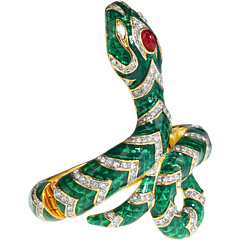 I love Kenneth J Lane; his animal jewelry is to die for! oh. my. gosh. that bracelet is amazing!